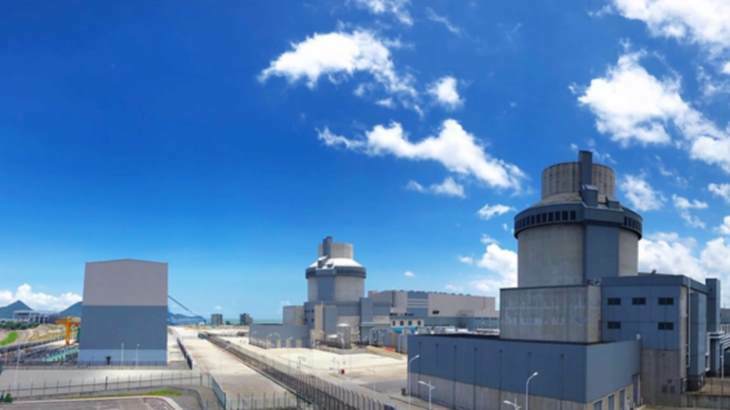 Unit 1 of the Sanmen nuclear power plant in China's Zhejiang province has completed 168 hours of full-power continuous operation. The AP1000 reactor is now deemed to be in commercial operation. China National Nuclear Corporation (CNNC) said the full-power demonstration test run was completed at 3.57am today. The reactor, it said, has now been "put into commercial operation conditions". Although CNNC must still obtain necessary permits and documentation, the unit can now be considered to be in commercial operation. In September 2007, Westinghouse and its partner the Shaw Group received authorisation to construct four AP1000 units in China: two at Sanmen in Zhejiang province and two more at Haiyang in Shandong province. Construction of Sanmen 1 began in April 2009, while first concrete for Sanmen 2 was poured in December 2009. Construction of Haiyang 1 and 2 began in September 2009 and June 2010, respectively. Hot testing of Sanmen 1 - which simulated the temperatures and pressures that the reactor's systems would be subjected to during normal operation - was completed in June last year. The loading of fuel assemblies into its core began on 25 April. The unit achieved first criticality - a sustained chain reaction - on 21 June. On 27 June, nuclear-generated steam was used for the first time to successfully rotate the turbine at rated speed. Sanmen 1 was connected to the grid on 30 June, becoming the world's first AP1000 to achieve grid connection and power generation. It reached 100% power for the first time on 14 August. Hot tests at Sanmen 2 were completed in January. That unit attained first criticality on 17 August and was grid connected a week later. The unit will now undergo gradual power ascension testing and is expected to enter commercial operation by the end of this year. State Nuclear Power Technology Corporation (SNPTC) said: "The successful construction of the Sanmen nuclear power project is an important achievement in the development of China's third-generation of nuclear power plants, and will vigorously promote the industrialisation of China's independent passive nuclear power technology." Unit 1 of the Haiyang plant attained first criticality on 8 August and was grid connected on 17 August. Haiyang 2 is expected to start up in 2019. With Sanmen 1 now in commercial operation, CNNC has a total of 19 power reactors in operation with an installed capacity of 16,716 MWe.